Today kicks off the 40th Cleveland International Film Festival! This year is later than most because of an early Easter, so I've been trying to wait patiently for one of my very favorite times of the year. If you've never been, what are you waiting for? It's one of the top rated film festivals in the country and there is truly a film for everyone. There are 190 feature films and over 200 shorts from across the world to choose from. Maybe you aren't really sure what to expect so here are some tips for you to make the most out of your experience at #CIFF40. Get your tickets ahead of time. These films will sell out, especially for ones during the most popular times. Look for discount codes on social media. There are several around offering $2 off per ticket. Take public transportation. There is parking at Tower City for $3 with validation, but it fills up fast. Save yourself the hassle and take the Rapid or a bus. At the very least, carpool with a bunch of friends. Get there early. You may not know this, but ticket holders line up before each movie starts and everyone is let in at once. There is no casually strolling in and finding a seat 5 minutes before the show starts. Give yourself at least a half hour. Dress for Success. Temperatures are unpredictable so layering ensures you'll be as comfortable as possible. Leave your high heels and big hats at home too. Be polite. Don't even think about talking, texting or otherwise being noisy during the films. That includes eating apples, rustling around in bags of chips and crumpling up packages. The people in attendance take this seriously. Consider yourself warned. Explore. Between films, take a stroll. There are tons of people in Tower City and downtown so you never know who you'll meet. Filmmakers, directors, celebrities or a friend you haven't seen in years may be right around the corner. You can check out the status of the Public Square renovations, try your luck at the casino or even go to the top of the Terminal Tower. Eat. There are soooo many great places to eat within walking distance, there is no reason to limit yourself to the food court. Some of my favorite deals are Happy Hour at Mortons or Blue Point, pizza by the slice at Vincenzo's, Noodlecat and Taza. If you have more time, you can even ride the Rapid over to Ohio City. Don't forget snacks and water for waiting in line too. A Must Do is to try Bloom Bakery. It's on Euclid Ave. across from Chipotle, right at Public Square. Everything, and I do mean everything, is fantastic. Plus it's a non-profit with the mission to help people learn skills and leave poverty behind. Expand your horizons. See a foreign film with subtitles. Check out a cool documentary. See a Shorts program. Support your local filmmakers. Talk to people in line - maybe you'll even make new friends! 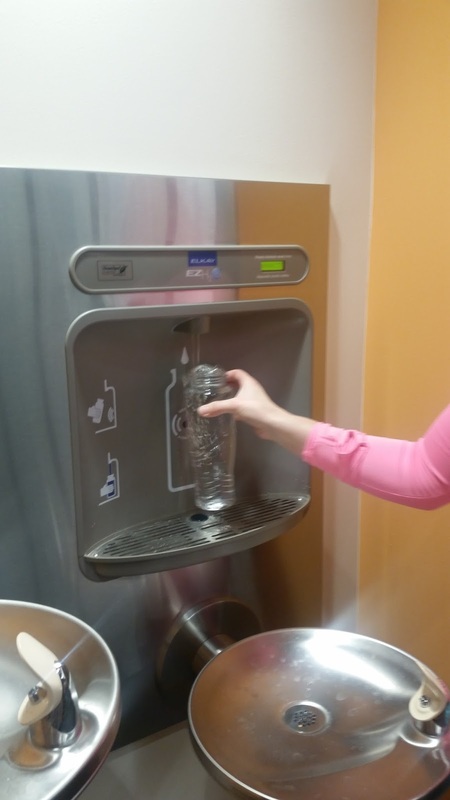 While you are there, be sure to check out the digital makeover this year too. I hope that these tips help you enjoy #CIFF40 whether you are a veteran like me or a first timer. 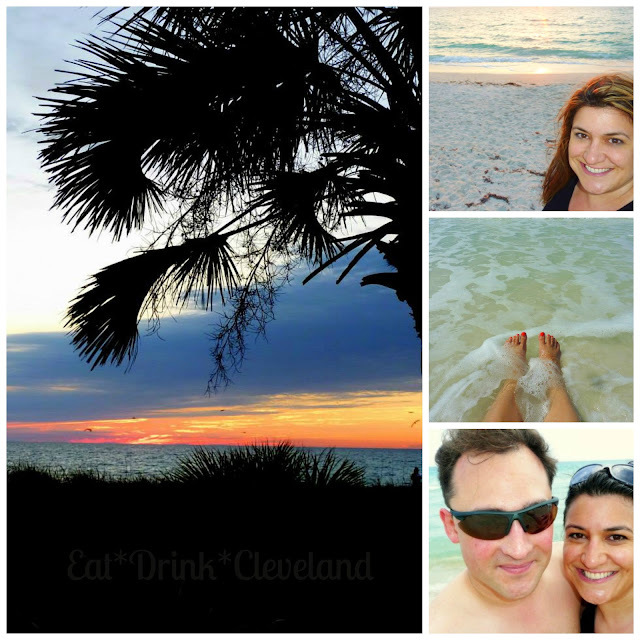 Follow along with me on Instagram, Twitter and Facebook. 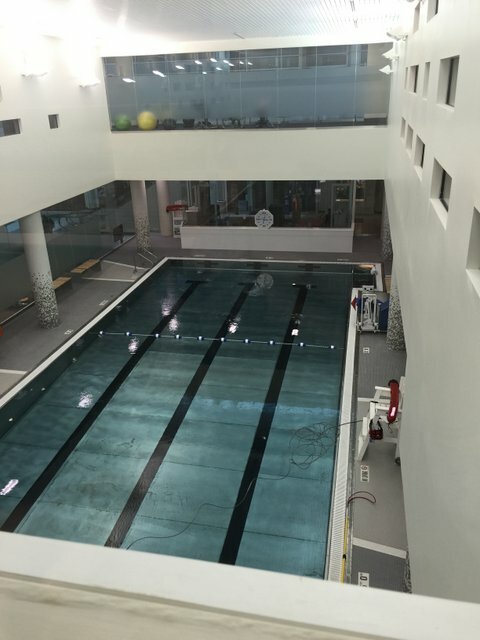 The New Downtown YMCA - and a Giveaway! New things are popping up all over Cleveland. I can hardly keep up with all the restaurants, hotels, shopping and apartments around town. And the best part is that a lot of the "new" is actually old spaces transformed - some of my favorite kind of recycling. A wonderful example is the Galleria. The unique former mall is now a mixed use space filled with shops, eateries, businesses, banks and more. 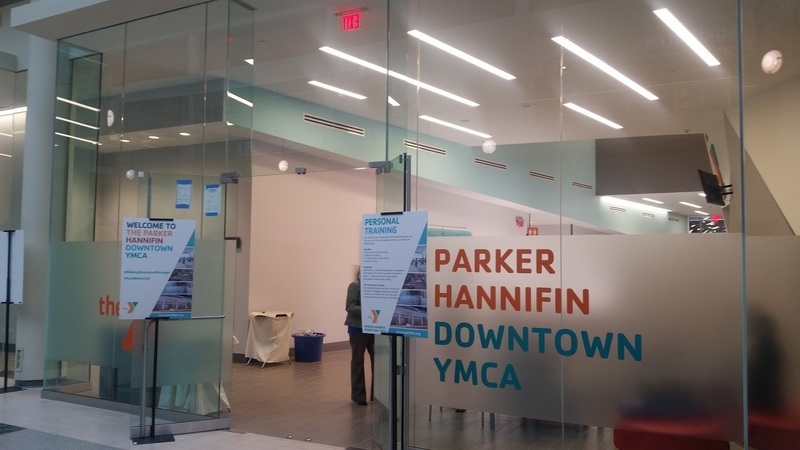 The latest addition is the Parker Hannifen Downtown YMCA. The facility opened to members today and the grand opening celebration is tomorrow, March 29th. 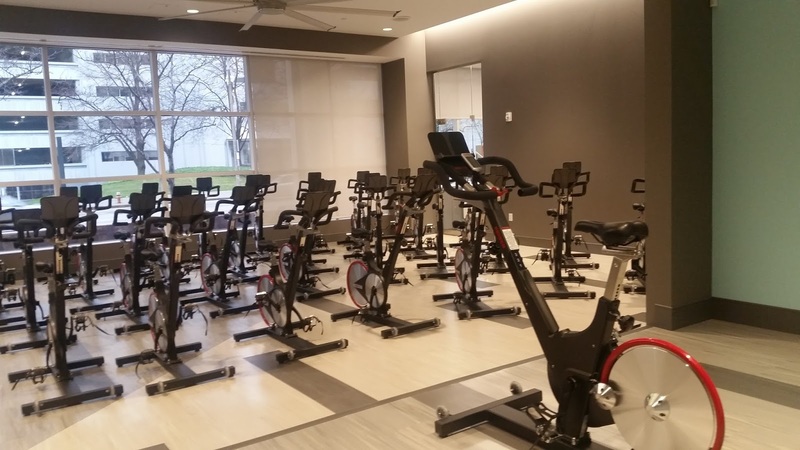 The two story space once occupied by Victoria's Secret and the Limited is now a 40,000 square foot state of the art health and fitness facility. I was offered the opportunity to take a look before they opened and to say I was impressed would be an understatement! They started off the evening with tasty snacks and a juice mocktail. And you have a chance to see how awesome it is for yourself because I am giving away an amazing package to help you #EatPlayLive! Use the Rafflecopter below to win a one-month free trial membership, 2 personal training sessions and one 30-minute massage session! The contest ends Sunday. Winner will have 24 hours to claim their prize: if unable to claim in that time, another winner will be selected. Good luck!! Follow the YMCA on Facebook, Twitter and Instagram. Follow the Galleria on Facebook. Spring has officially sprung. Everyone survived the change to Daylight Savings time, the robins are back, my crocus and daffodils (and dandelions!) are in bloom and according to the calendar, it is finally officially here. In NE Ohio, it might not be time to put away our scarves just yet, but everyone is definitely thankful that winter is over and we are ready for spring. Whether you're thinking of Easter, Passover, gardening or March Madness, it's a great time of year! But nothing is better than an early spring trip to somewhere tropical. That's where I want to be ~ Sandals. Sundresses. Painted toes. Beaches. Palm trees. Cocktails. I love a tasty tropical cocktail - who doesn't? But I'm not a huge fan of the typical neon-colored sugar water and cheap booze that you normally find at the beach. My favorite kind of cocktail is a classic with a twist. This super easy cocktail mixes up fast and is perfect for anytime you want to add a little tropical fun to your cocktail menu ~ whether you're on vacation or just want to feel like you are. Fill shaker with ice. Add half & half and coconut milk. Shake vigorously. You want the dairy to be really cold and frothy. 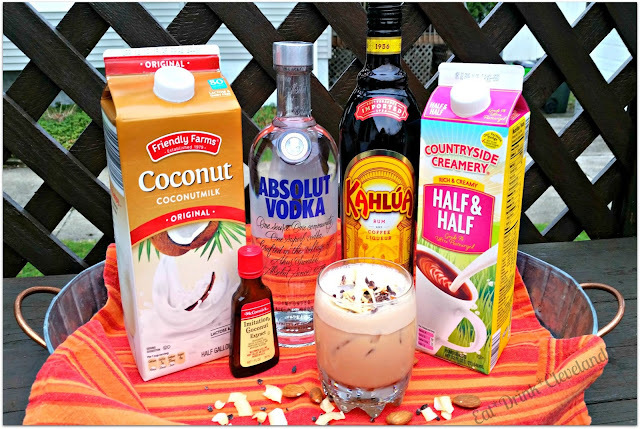 Add Kahlúa®, Absolut and coconut extract. Shake, shake and shake again. If you want to go old school, serve over ice. If you want to look a little fancy, pour into a martini glass. 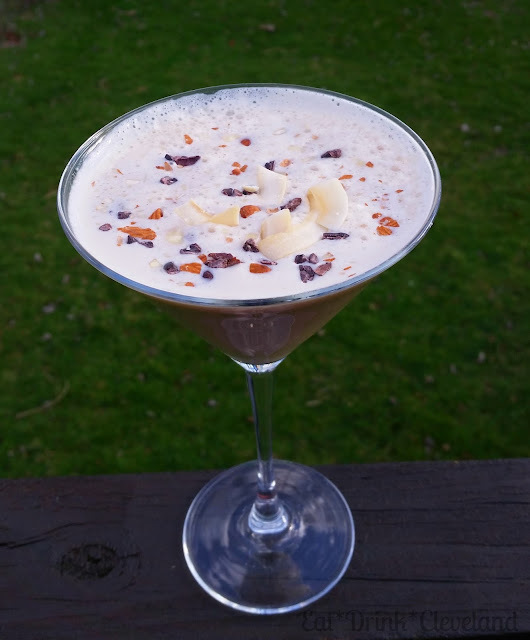 Garnish with cocoa nibs, chopped almonds and shaved coconut. Enjoy! I used the coconut milk you find in the refrigerated section of the grocery store. It's really delicious and so much better than the canned variety. Look for coconut nibs in the bulk food section - it's a pricey ingredient and this way you can buy just what you need. extract. It will make the drink sweeter so adjust the amount accordingly. You can use it to make a coconut Kahlúa® flavored coffee too! Mix in some banana puree for an tasty twist. 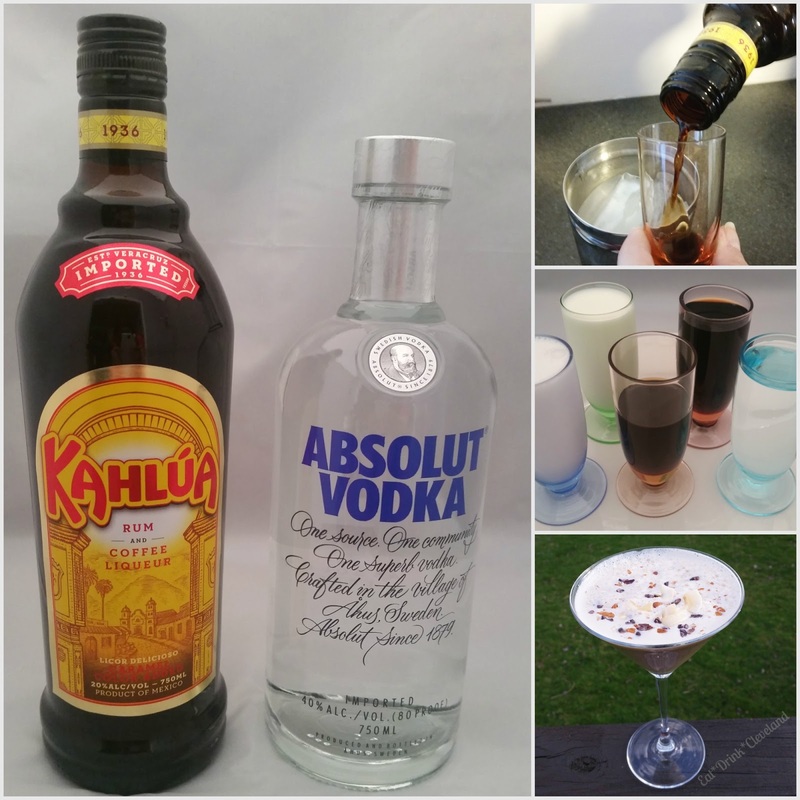 For more great cocktail ideas, follow Kahlúa® on Facebook, Twitter and Instagram. 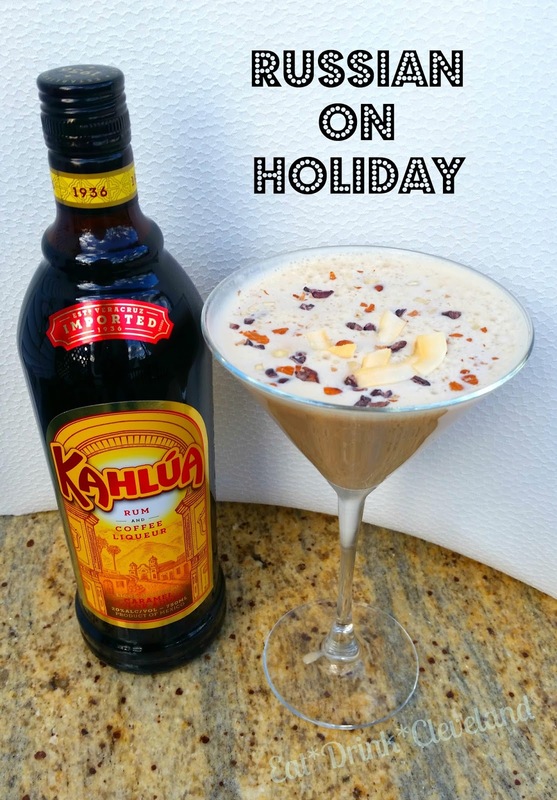 *** Disclosure: I partnered with Kahlúa® to bring you this post. This weekend is the Cleveland Home + Remodeling Expo! Just in time for spring and those fun projects you've been thinking of all winter. If you act fast, you can win two tickets today! The three-day home improvement expo will showcase everything needed to take a renovation project from start-to-finish whether renting or owning a home. Tiny Homes built by Small Spaces CLE will let visitors see why tiny homes are one of the biggest trends in home design. Walk through two homes – both under 200-square-feet – and experience first-hand why a luxury home doesn’t always mean thousands of square feet. 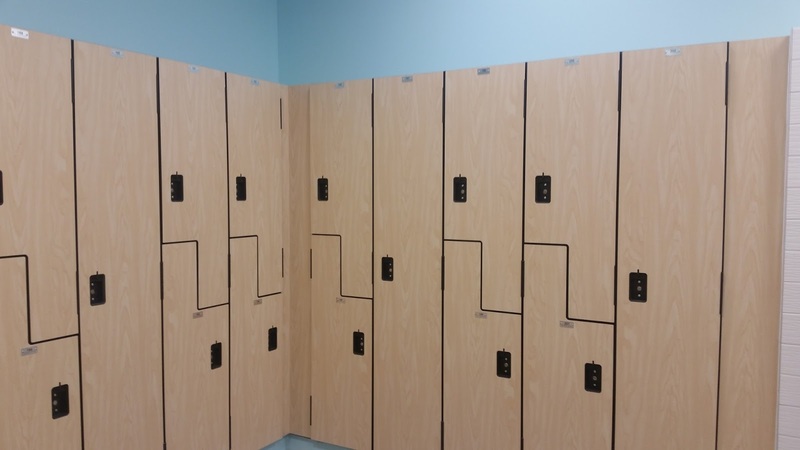 Each also will provide inspiration for streamlining and enhancing the efficiency of any home or apartment. Local celebrities compete for bragging rights with the Better Gnomes and Gardens show feature. Celebrities will design their own gnome for display at the entrance to the Expo and visitors will vote on their favorite. They will also be able to bid in a silent auction to benefit a local charity. The Main Stage, furnished and decorated by Metro Home, will offer attendees the best of home improvement celebrity appearances. With appearances by nationally-recognized stars and home improvement experts, the Main Stage is one of the most popular destinations at the Expo. Drew and Jonathan Scott – Hosts of HGTV’s “Property Brothers” will appear on The Main Stage Saturday, March 19. Derek “Deek” Diedricksen - recent host of HGTV’s “Tiny House Builders,” will be appearing on the Main Stage Friday, March 18 through Sunday, March 20. Ursula Carmona - Local DIY superhero behind the nationally recognized blog, “Home Made by Carmona,” Ursula Carmona, will appear on the Main Stage on Friday, March 18 and Sunday, March 20. The How-To Stage, Designed for the attendee that would like to be a do-it-yourselfer, will provide step-by-step instruction on how to use many of the products or services available to purchase or for hire at the Expo. The A.J. Heil Florist Flower Market - Year-round fresh cut flowers offer a simple way to perk up any space. Stop by to take home a bouquet of fresh flowers. The Marketplace will feature products for cash-and-carry from local artisans and vendors. Use discount code EATCLEHR for $3 off your tickets. Or you can win a pair of tickets here! Complete the entries below and leave a comment (for each one separately) with a link to your Tweet, share, etc. Winner will be selected randomly. 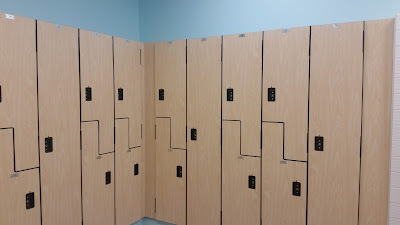 Please make sure you leave a way for me to reach you if you win. Leave a comment either here or on Facebook telling me what project you'll be working on or what part of the show is your favorite. Share this blog post on Facebook, Twitter, Pinterest or Instagram. Winner will be chosen Friday at 11pm. Tickets will be picked up at the show. This is a hearty and flavorful soup that is so easy and quick, it's perfect for a Meatless Monday or as a delicious alternative to your Friday Fish Fry. To make it vegetarian, use all veggie broth. To beef it up, add 1/2 a pound of ground beef or pork or some chopped bacon when you are sautéing the veggies. 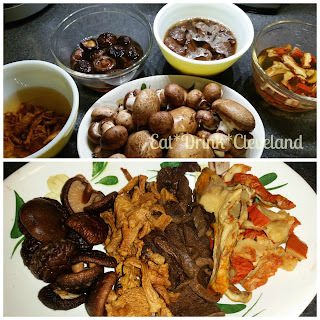 I used a mixture of shiitake , hedgehog, lobster and bolete dried mushrooms from Market District's bulk foods. 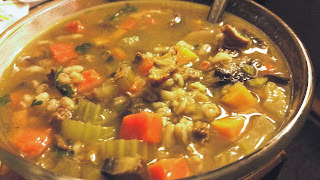 Shiitake was the only one I had even heard of before so I thought this soup was a great excuse to try them. Don't freak out when you see the price per pound - my cost for all of these exotic mushrooms was only about $4. And if you don't find these specific varieties, just substitute your favorites or what's available in your area. Cover the dried mushrooms with 6 cups of boiling water in a large bowl pot. Cover and set aside for at least 20 minutes. While the dried mushrooms are rehydrating, heat the olive oil in a large pot or Dutch oven. Add the onions, carrots and celery and sauté over medium heat for 10 minutes, stirring occasionally, until the vegetables are tender. Add the garlic, sweet potato and farro and cook for 2 minutes, stirring occasionally. Add the fresh mushrooms and 1 cup Marsala and cook for 5 to 7 minutes, until the mushrooms have released some of their liquid. After the dried mushrooms are soft, remove from liquid, reserving the liquid. Coarsely chop the mushrooms and add them to the pot, along with the soaking liquid, broth, thyme, 4 teaspoons salt and 2 teaspoon pepper. Bring to a boil, lower the heat, and simmer partially covered for 20 minutes, until the farro is tender. Discard the thyme and bay leaf. In a small bowl, combine the flour and butter and stir. Add a little of the hot soup liquid and stir until smooth. Add to the hot soup. Simmer for 5 minutes, then stir in the yogurt and remaining 2 tablespoons of Marsala. Stir in parsley. Serve with crusty bread. Enjoy! If you are looking for the perfect pot, this one is excellent AND it's made in the USA. Adapted from Ina Garten's recipe. 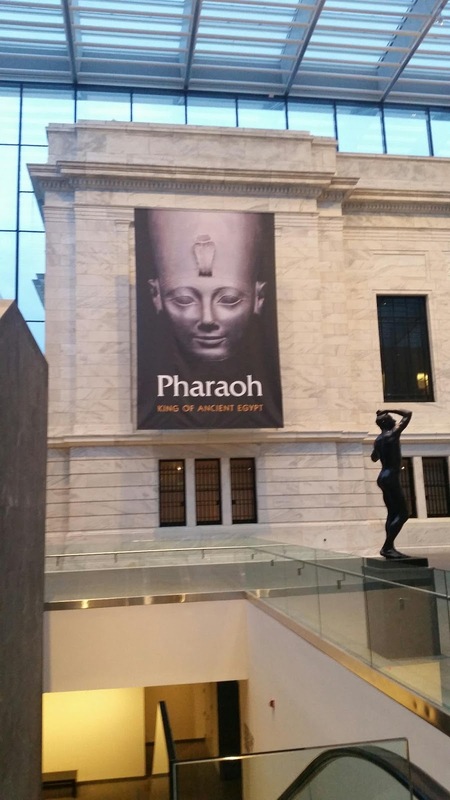 Last night I had the opportunity to view the Cleveland Museum of Art's centennial exhibition: Pharaoh: King of Ancient Egypt. It's a gorgeous collection and I'm excited to share this sneak peek with you! 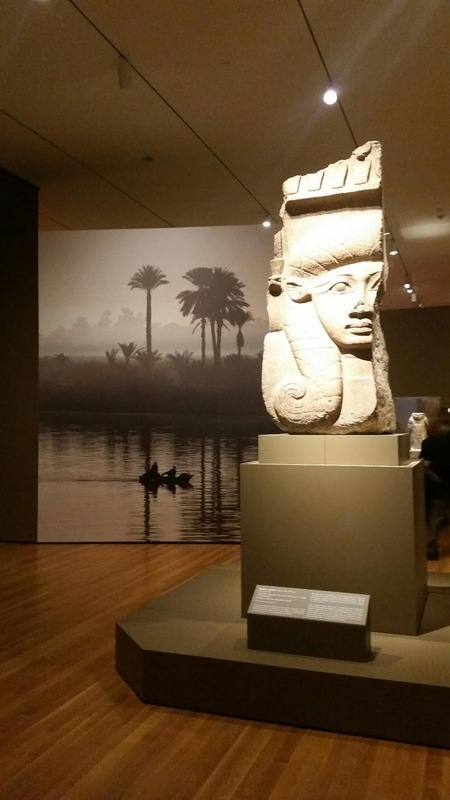 The British Museum's collaboration with CMA brings together a vast collection of sculptures, exquisite jewelry, papyrus and more. 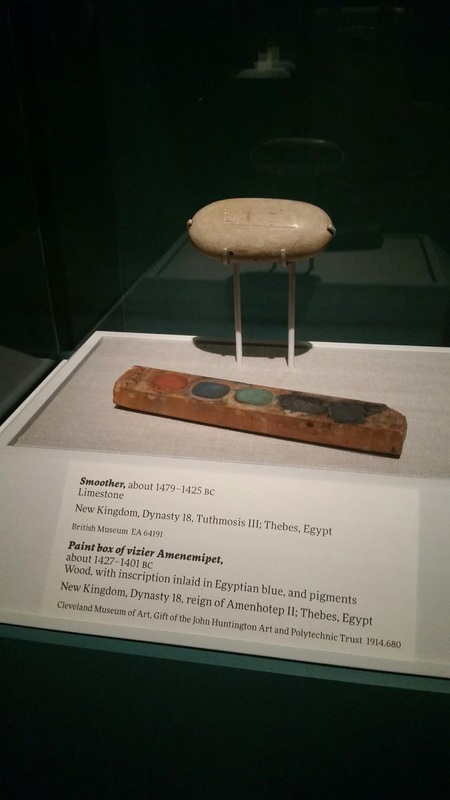 The collection looks past the myth to reveal the carefully designed personas of the Egyptian kings and explore the realities of daily life for the ancient royals. It brings to life 3,000 years of ancient history. The exhibition runs from this Sunday March 13th to Sunday June 12th. It will certainly be popular so be sure to purchase your tickets in advance. These ultra fragile items somehow have managed to survive for centuries. The colors are still vibrant and it's awesome to be able to see these delicate items so close. 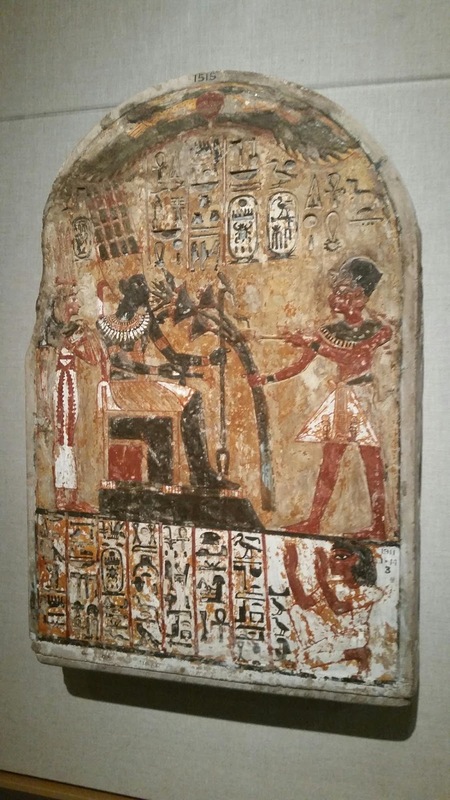 In addition to viewing the exhibition, there are many other ways to experience Pharaoh. Dinner served Wednesday and Friday from 5 - 8pm. Mix gets an Egyptian flavor with a pop-up from Provenance. Pyramids & Sphinxes is on view now through May 24, 2016 in the Mark Schwartz and Bettina Katz Photography Gallery. This mixed-media exhibition explores how European artists of the 19th century used brush, paint and camera to document tombs, temples, fallen colossi and other monuments that symbolized a once glorious, now vanished empire. Pyramids & Sphinxes includes the museum’s recent acquisition of the stunning Temple of Edfu: The Door of the Pylon by John Frederick Lewis(British, 1805–1876), a great master of Victorian English watercolor. Let your creativity and the museum’s collection serve as your guides through ancient Egypt. Bring your family to the Cleveland Museum of Art on the second Sunday of every month for a variety of family-friendly activities,including art making, Art Stories, Art Cart, scavenger hunts and more. For more events and other details, go online or visit the museum's Facebook page. 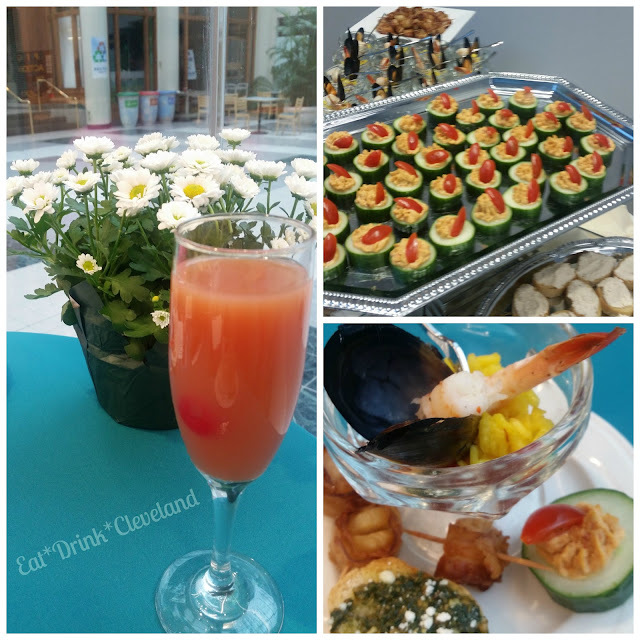 I was recently invited to attend The Art of Mixology - an exploration of the history and evolution of the French 75 cocktail at Provenance at the Cleveland Museum of Art. 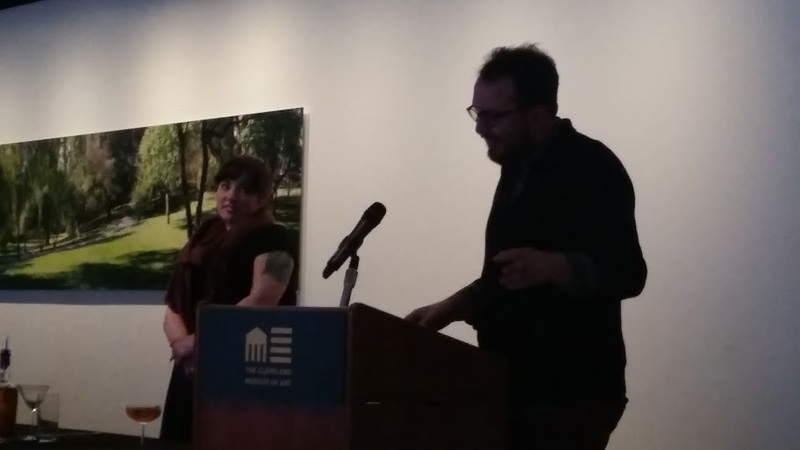 Will Hollingsworth of the fabulous The Spotted Owl gave an in-depth lecture about the evolution of the French 75 while Sullivan served as his lovely assistant and bartender. These expert mixologists were the perfect combination of knowledge, skill, humor and great storytelling. Obviously, the cocktails didn't disappoint. Will described the cocktails as "a beautiful young woman with a dark past" and told the fascinating history of the French 75, from it's origins in WWI in France to England and eventually America. Sullivan created each of the versions for everyone to sample. The 1919 French version was my favorite. It contained Apple Jack from Tom's Foolery (instead of the traditional Calvados from Normandy), grenadine, gin and absinthe. This potent drink definitely lived up to it's reputation for having a kick like a 75 Howitzer (yep, that's where the name came from!) but the slightly anise flavor of the absinthe won me over. The British version of 1922 was my least favorite of the trio because it was a little harsh but it certainly wasn't terrible. It was shaken instead of stirred and contained lemon juice, 2 dashes of grenadine, apple jack and gin. The 1928 American version was a tasty lemonade like cocktail of lemon juice, lemon sherbet, Tanqueray and champagne and was refreshing and delicious. We discussed champagne too and learned about the Champagne Riots of 1911 and that you should always serve your champagne cocktails with ice and not in a flute. 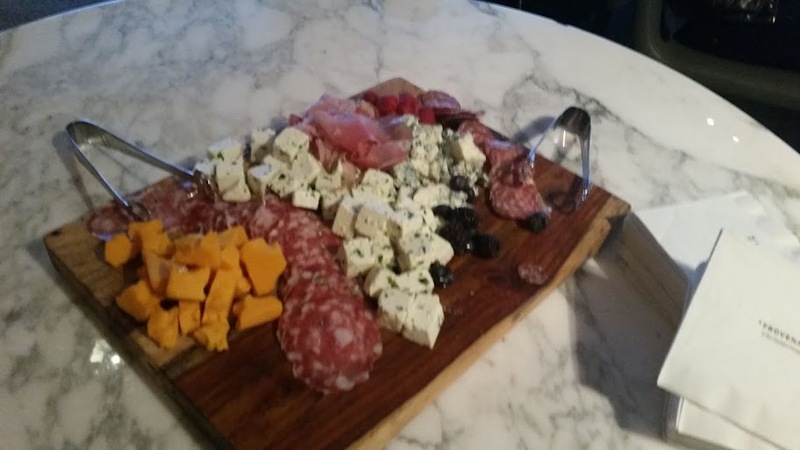 Besides samples of all three versions of the cocktail, they also provided a very nice board of cured meats and cheeses. More Art of Mixology events are in the works but they do not have the specifics yet. My only disappointment was that they used plastic instead of real glassware. Otherwise, it was a fun and tasty event and well worth the $35 fee. Check Facebook for details as they become available. 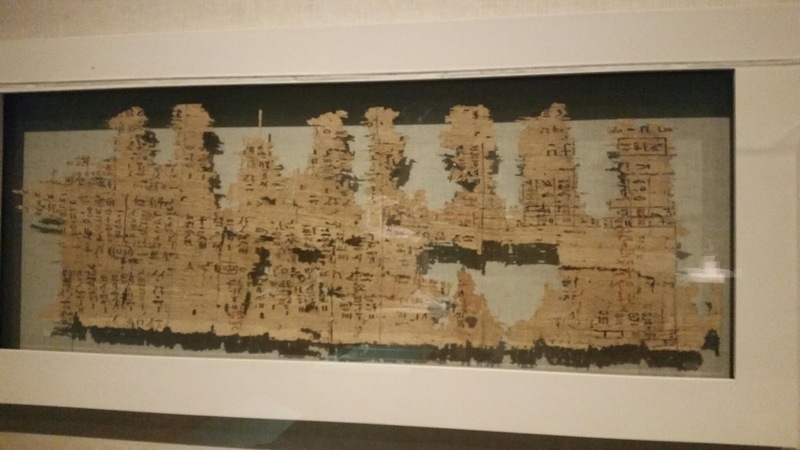 The special exhibit brings 3,000 years of ancient history to life through some of the finest objects from the vast Egyptian holdings of the British Museum, from monumental sculpture to exquisite jewelry, supplemented by masterworks from the Cleveland collection. The exhibit runs from March 13th to June 12th. $17 per adult. The first Friday of every month experience a fun mix of art, music and mingling that is a fun way to kick off the weekend featuring music, special tours and make your own art. Advance tickets $8; $10 day of event. 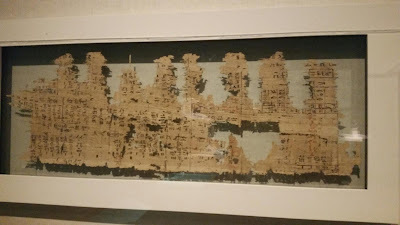 CMA members FREE.